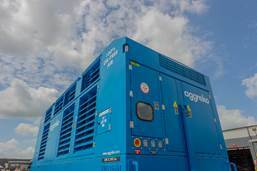 Aggreko plc has unveiled a new fleet of 100 per cent oil-free air (OFA) compressors for industrial and commercial applications. Utilizing 100 per cent oil-free air provides a vital support component for these industries’ processes to maintain a safe, clean working environment and smooth-running, reliable operations. “As global energy markets change, the challenges our customers face around limiting emissions and accessing reliable utilities are becoming ever-more complex. Aggreko’s commitment to evolve our oil-free air compressor line ensures our customers can deliver their highest standard performance, with the peace of mind they are running a viable solution that includes the latest emissions reduction technology” said Terry Dressel, VP of Central Operations, Aggreko North America. The new oil-free air compressors, assembled in the USA, are compliant with the toughest emissions standards in North America, feature ISO class 0 air out and deliver 1,600 cfm at air pressures to 55-150 psi. Available for short or long-term needs, Aggreko’s 100 per cent oil-free air equipment is now in operation. Aggreko Remote Monitoring (ARM) is provided on all Aggreko compressed air equipment. The units provide operating parameters to the Remote Operations Center (ROC) where teams of field-experienced engineers and technicians monitor compressor performance 24/7 and are ready to respond to potential problems immediately. Performance data, alerts and service information are available to customers via an ARM smartphone app.